Go west to explore the wonders of Western Australia on a 6-day journey that begins and ends in the stunning capital city of Perth. To follow this campervan driving itinerary, pick up and return your vehicle at our Perth branch. Visit maui campervan hire Perth for more details. Perth, capital of Western Australia offers a wide variety of day tours & attractions to visit. Spend the day exploring the city & enjoying some of the key highlights including a ferry trip on the Swan River to Fremantle, Kings Park, Lake Monger, Northbridge, the Perth Mint and Perth Zoo, and surf or swim in the ocean beaches. Or take a day cruise to Rottnest Island and meet the local natives – including the cute Quokka – a native marsupial found primarily on Rottnest. Head off early for the drive north to The Pinnacles Desert – a 'must see' natural attraction in Western Australia. The Pinnacles are unusual natural rock formations similar to a 'moonscape'. Arrive at Nambung National Park at approximately lunch time and spend the afternoon exploring this unique landscape. The park is very popular for photographers. Stay in local accommodation, camp at nearby Cervantes or Jurien Bay. Continue on the road north to Kalbarri and arrive at Kalbarri National Park by late morning. 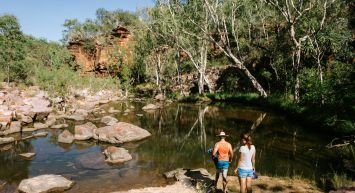 Kalbarri features spectacular rivers and gorges landscapes overlooking the Indian Ocean. Sea cliffs with multi-coloured sandstone can be viewed at Red Bluff. Enjoy an afternoon discovering this natural coastal attraction. Camp the night at the National Park, or stay in the nearby town of Kalbarri. Head off early again and drive north to Denham. Denham is the main town close to the natural attractions of Monkey Mia and the Shark Bay Marine Park. Monkey Mia is famous for offering visitors the opportunity to interact with wild dolphins. The best time to see the dolphins is between 8am and 1pm daily when they are fed under the supervision of Park Rangers. In addition to dolphins, the Shark Bay Marine Park offers a variety of marine life for visitors to view including sea turtles, school sharks, manta rays, and dugongs. Just north of Denham school sharks and turtles can be seen in the ocean. Marine tours are offered daily from Denham. Overnight in Denham or camp in nearby Francois Peron National Park. Time to begin the return trip towards Perth. Drive back to Geraldton. Geraldton is a bustling holiday destination with interesting museums, white sandy beaches, and a good spot for windsurfing. Pick up a brochure from the local Information Centre to follow the Heritage Trail around the town. 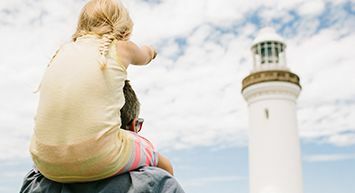 Stay overnight in local accommodation or a caravan park in Geraldton. From Geraldton head east towards Mullewa – the gateway to the Murchison goldfields - and then south back towards Perth on the 'inland road' via Three Springs, Watheroo National Park, Moora and Avon Valley National Park. Avon Valley is popular for its forests, river valleys, and beautiful wildflowers (in season); panoramic views of the Avon River can be seen from the highest point, Bald Hill. Arrive back in Perth in the early evening.